A Palm Beach woman was scheduled to have a relatively simple spinal fusion surgery done at Wellington Regional Medical Center but left without her kidney. Now she’s suing for medical malpractice. The general surgeon, who was tasked with operating on the woman, mistook her kidney for a tumor and, without her consent, removed it entirely. MRIs had revealed that she had what is called a pelvic kidney. It’s a condition where the kidney is misplaced and oriented near to the pelvis. The doctor identified the pelvic kidney as a “pelvic mass” and diagnosed her with cancer on the spot. He removed the kidney and sent for it to be identified. The medical examiner identified it as a healthy human kidney. The MRI, which was part of her patient records, showed that the woman had the condition known as pelvic kidney. Had the doctor reviewed these records before operating on the woman, he would have known that she had a pelvic kidney and not a pelvic mass. The lawsuit was settled for an undisclosed amount of money and the doctor has since had his surgical privileges revoked. He also faces an administrative complaint from the Florida Medical Board, the outcome of which is still pending. The general surgeon was part of a team of three surgeons. The other two were orthopedic surgeons who were tasked with fusing the vertebrae. The lawsuit named them for failing to ensure that the general surgeon had consulted with the patient or was aware of the pelvic kidney before they operated. The procedure required that the surgeon go through the anterior part of the patient’s body (as opposed to the back) in order to access the vertebrae. These were settled for $250,000 per doctor. While Florida has not been known as a state that is tough on disciplining doctors, it does require that a surgeon face review for operating on the wrong part of a patient’s body or performing a medical procedure which is not authorized or medically unnecessary. This caused the Florida Surgeon General to recommend that the doctor’s license be revoked permanently. This might be due to a number of oddities surrounding the case. The first, of course, is that the general surgeon never met with the patient or reviewed her medical records. Second, the general surgeon did not carry any medical malpractice insurance, which is rare. 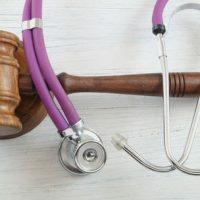 While there is no federal statute requiring doctors to carry medical malpractice insurance, the majority of states do have laws that require them to either carry insurance or prove that they can back a claim against them by some other means. Florida does, however, require doctors to inform patients that they do not carry malpractice insurance. If you’ve been injured by medical negligence, the Palmer Law Firm, P.A. in Tampa can help you litigate your claim and recover damages from the at-fault party. Give us a call or talk to us online to set up a case evaluation.